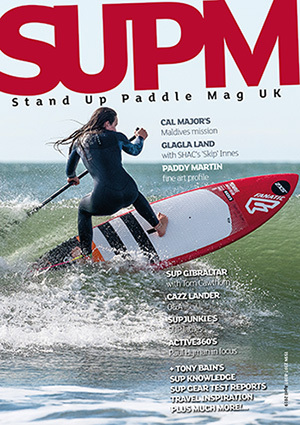 The SUP race scene has exploded in recent years, with a world tour seeing top paddlers competing all over the world in a wide variety of events. While events like Lost Mills in Germany can cover several days, most races still consist of a race on one day. Most races, but not all – there is one race that has grown quietly bigger year on year since 2009 which has come to be known unofficially as the Tour de France of SUP. That race is the 11 Cities, held in the province of Friesland in the north of the Netherlands. is a race like no other in SUP, 220km paddled in five days – roughly the equivalent of paddling a marathon a day for four days before the short final day of a mere 31kms. 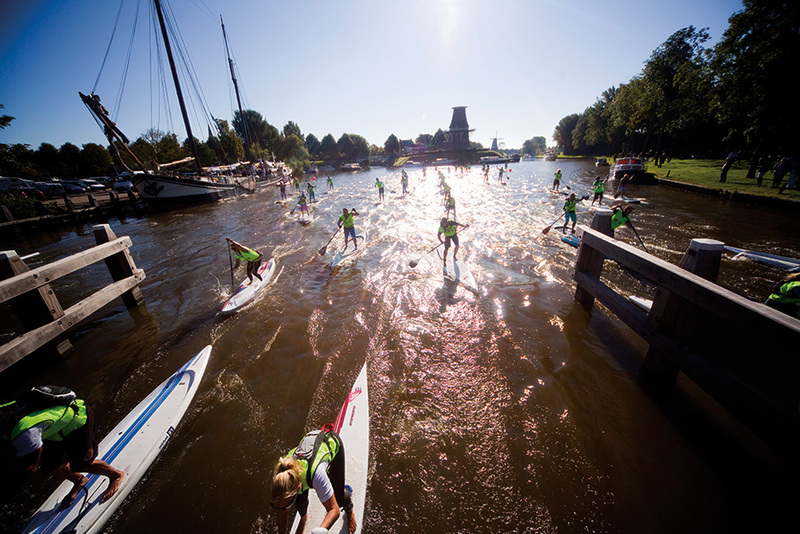 Paddled entirely on inland waters in Friesland, the race has become legendary as a test of both physical and mental endurance. The race was originally conceived by Anne Marie Reichman, a Team Starboard rider and native of Friesland, who based the race on the Dutch ice skating race called the Elfstedentocht or 11 Cities that was first run in 1909. Due to the requirements for ice 15cm thick over the entire course, the race has only run fifteen times, the last one in 1997. Anne Marie first ran a trial invitation event to test the idea of doing the course by SUP in 2009. Since then the race has continued to grow. The race follows the classic route, passing through the 11 Cities of Friesland: Leeuwarden, Sneek, IJIst, Sloten, Stavoren, Hindeloopen, Workum, Bolsward, Harlingen, Franeker and Dokkum. 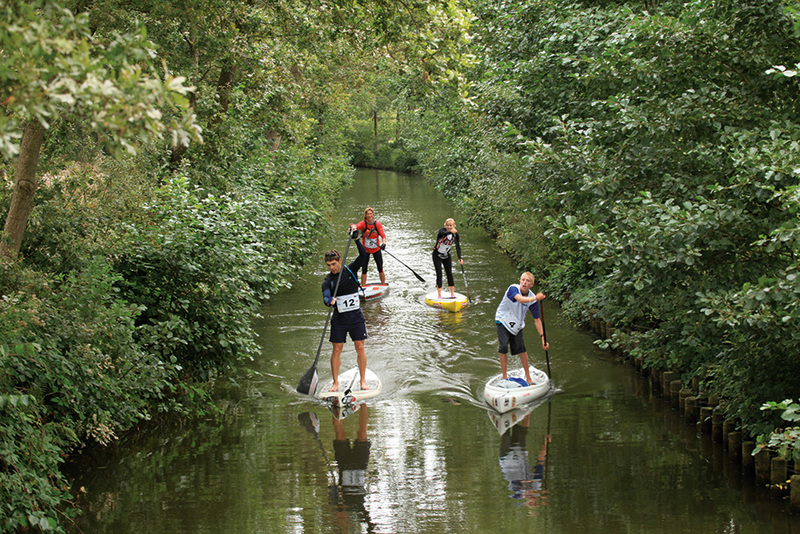 The SUP race starts and finishes in Leeuwarden. While the racing is on inland waterways, these vary quite dramatically from narrow canals just a few metres wide through to major lakes and marine waterways, where coastal freighters can be ploughing their way along. 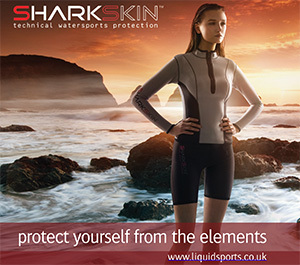 As a result, while the waters are normally flat, some of the lakes and waterways are large enough for significant chop and you can even find yourself almost downwinding in sections of the course, so strong is the wind on occasion. This variety of water and the changeable weather conditions combined with the sheer distance are what make the 11 Cities so challenging. Last year saw almost perfect conditions with warm weather and low wind, while the 2011 race saw wind conditions so bad (gusting 25 knot headwinds) that the race was almost cancelled before it started. The Dutch organisers do an outstanding job each year and those who return to do the race more than once find themselves greeted like long lost friends. If there was another name for the 11 Cities, it would have to be the ‘friendly race’. Battling over those distances forges camaraderie amongst all those involved. The race runs in September every year. In 2015 the dates are the 2-6th. The main race itself is split into three main categories: race participants (competitive solo paddlers doing all five days), a team competition where a group of riders change the designated paddler for each day and the Tour for those who want to do the course but in a non-competitive way. Since 2011 it has also been possible to just paddle specific day stages. While the main race takes five days, there is also a non-stop event which in 2015 takes place from 31 August to 1 September. Run for the first time in 2014, the non-stop race saw a winning time of just over 26 hours and 20 minutes. Day One runs from Leeuwarden to Sloten and is 43kms long. The race starts in the middle of Leeuwarden, with riders jostling for position in what is a crowded start line. The different categories set off at intervals, but the canal walls ensure that the first kilometre sees significant wash as riders seek to get the best start. Leeuwarden the difference in Dutch waterways compared to the UK becomes clear as you find yourself paddling up a long straight canal wider than the Thames often is. The race quickly enters the countryside and for the paddlers little clusters of peers who paddle at the same pace start to emerge on the water. At Sneek you find the first of the mandatory daily lunch stops where all paddlers have to take a minimum 15 minutes break off their board. Day One ends with the Slotermeer; 3km of open water to cross on one of the largest lakes in the region. On a bad day the wind can make the crossing a battle against the elements, before you reach the final short run into Sloten. After paddling 43km, the one thing you need is a massage – and included in the entry price is a proper sports massage each night for every competitor. Waiting your turn gives you an opportunity to swap stories and experiences, before the dinner that evening. 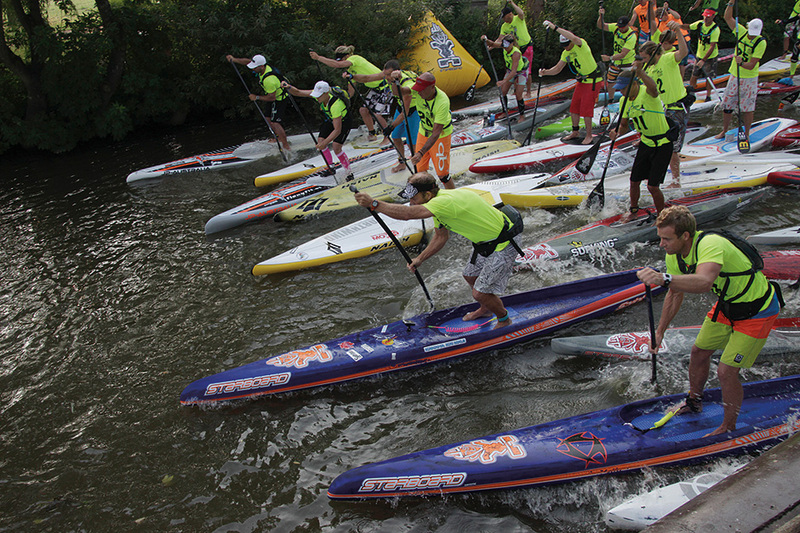 The SUP 11-City tour began in 2009 as an invitational event for athletes with a respectable and professional background in SUP, windsurf and other endurance sports. Connor Baxter, Zane Schweitzer, Marc Raaphorst, Donna Raaphorst, Eric Terrien, Bart de Zwart and Byron Kurt were some of the invited athletes. For those who complete the 11 Cities, everyone usually has a favourite and also a least favourite day. I’ve always struggled with Day 2, covering 45km from Sloten to Workum. Each of the days tends to have a feature that the other days don’t and Day two has three lakes to cross before the long run up a wide channel to the lunch break at Stavoren. 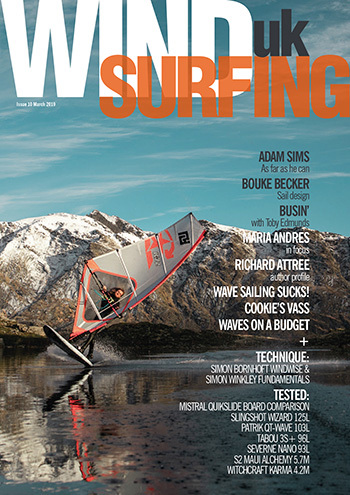 The morning can see racers exposed to headwinds, so much so that Casper Steinfarth in 2011 estimated he spent 10 minutes paddling flat out just to stay stationary such were the headwinds heading up to Stavoren. Day three, 42km from Workum to Franeker, is arguably closest in conditions to the inland waterways of the UK, with a little weed in the water and at times narrow waterways that twist and turn in parts, before you pop out onto another major estuary and hopefully a tailwind to push you towards Franeker. 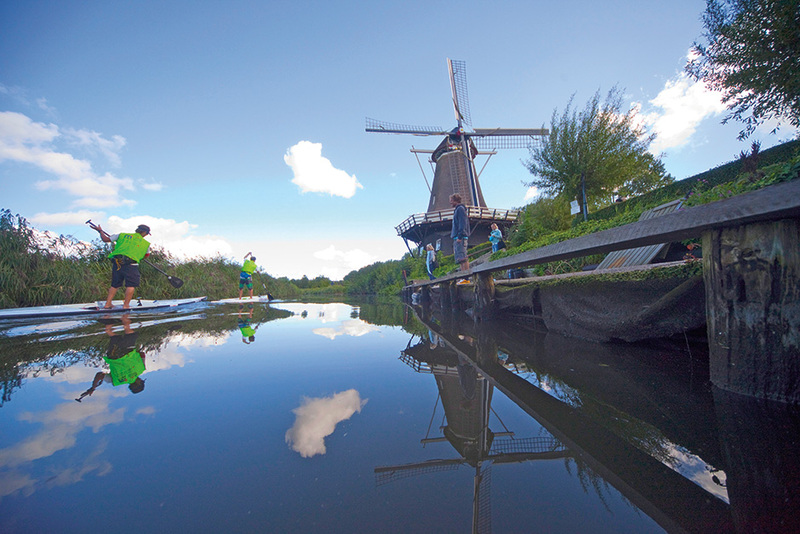 Day 4 brings 43km from Franeker to Dokkum, a long straight route that sees quick times and is also the only day where you have to get off your board and relaunch due to a lock. in 2010 teams took part to lower the ‘mental and physical barrier’ of participation and to broaden the level of participants. Teams of 2-5 paddlers could paddle the event. One team member paddles the entire day stage (30-45 km). The next team participant paddles the following day, etc. By Day 5 the only thought of most paddlers is that the race is almost over. Yet Day 5 is also the busiest day, as the race is swelled by one-day entrants for the 27km final section. The contrast between the fresh faces wondering if they can manage the distance and the paddle hardened race competitors with nearly 200k already completed is stark. The day’s lunch stop takes place at the famous 11 Cities bridge, covered in individual tiles showing ice skaters who have done the route, and from there it is a mere 10km to the finish and the final massage. Having done the race twice, for me the physical challenge is not the hardest element; rather it is the mental challenge, especially after the first day, when you now realise that you have four more long days ahead of you. The sense of achievement at the race end is incredible, whether it is your first time or not. The 11 Cities is a unique race, run by a superb team, with an international field of paddlers that everyone should do at least once. In my first race in 2011, after I had just spent nine hours paddling, Anne-Marie Reichman’s mother told me that it didn’t matter where you finished in the race, everyone who finished the 11 Cities is a winner. And she’s right. Paul Ellis completed the 11 Cities in 2011 and 2012, he hasn’t completely ruled out doing it for a third time!